Thank you Bromptonboy. I had guessed as much, but I like the confirmation. To amend my last comments a little, it seems that the Standard Gauge stopped at the division of Anchor Wharf and Gun Wharf. However the narrow gauge metals continued as I said almost to Sun Pier. This map is so full of information, again thanks for posting this Cliveh. Sentinel S4, the standard gauge did go through onto Gun Wharf. If you go to the end of Anchor Wharf you can see the rail going under the wall that now blocks the old gateway from Anchor Wharf to Gun Wharf. As one of the 'Brompton Gang' we used to shin over the old RM Barracks wall and gain access to the Gun Wharf area and I recall the railway tracks. Also of great interest is the original Bill that was put forward for the original route of the railway. 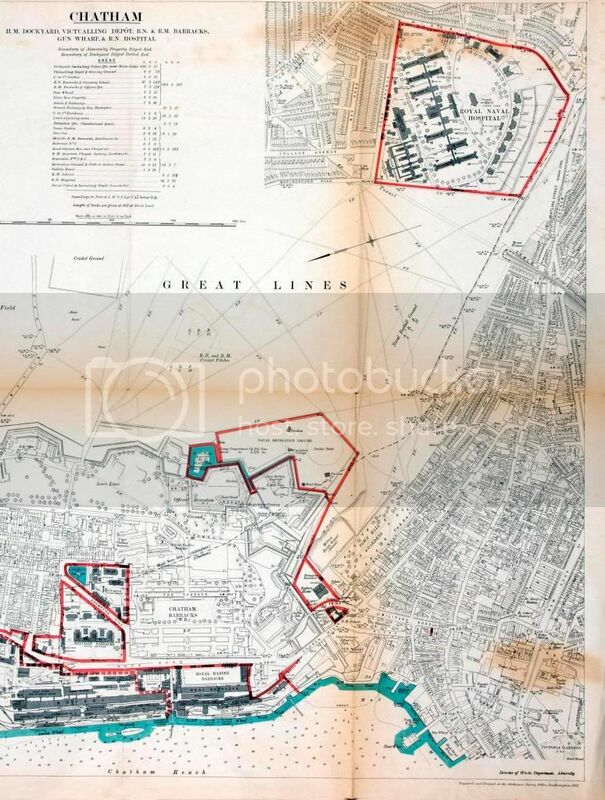 This took it on an elevated section from Rochester parallel with the river right into Chatham where at Military Road a branch was to enter the Dockyard via Gun Wharf. The main line was to enter a tunnel on the escarpment of the Lines roughly where Chatham Town Hall was built. The WD put a halt to this plan as they didn't want the railway going under the Fort Amherst area. As you can see on the plan there were two smitheries Maid of Kent. No.1 Smithery is still there and open to visitors. Much of it has been converted into modern exhibition spaces but part of it has been left more or less as it was. No.2 Smithery was demolished in 1980 to make way for extra car parking - just 4 years before the Dockyard's closure! Went onto the site mentioned by the last writer and found the Smithery where a relation, Arthur Mudge, worked as a blacksmith from the mid 1890s to 1930s - it says in his obit C.M.Dept can anyone tell me what that department was. I am hoping to make a visit to the Dockyard this Sept - will I be able to find where the Smithery was. 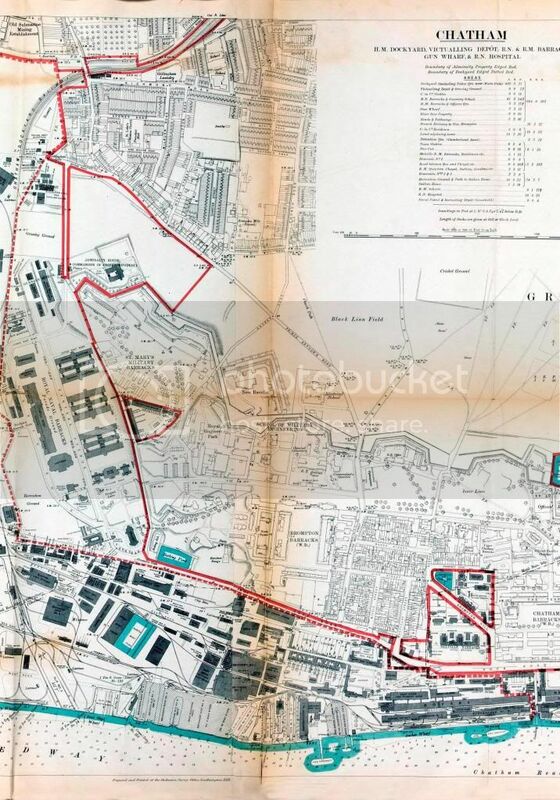 I also see on the maps on this site (1911) mention of Chatham Barracks, would this be the same as Chatham Garrison (1890s) where my g.grandfather was Garrison Sgt. Major, if so, will I be able to find something of that too. This collection is available on the web. 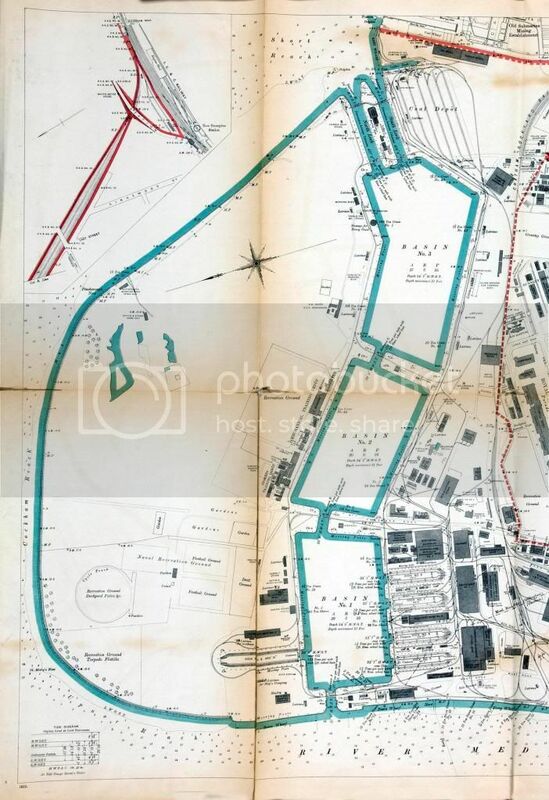 British Empire Dockyards and Ports, 1909. There is also a plan for Sheerness. That is fantastic. Thanks Cliveh. As a railway enthusiast it answers a lot of questions. I did not realise that the rails almost reached Sun Pier. That would have made the SER Chatham Central Station more viable if the connection had ever been made. Very interesting, I would love to view the original, again from the railway point of view.